NOTE: This road is also referred to as "Stone Mountain Road" and has a nice web page focussed on this road. Start out in Keystone SD and take Hwy 16A southeast. 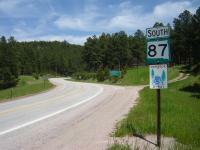 This road will zig zag all around and then take you into Custer State Park and merge with state route 87. For a bonus trip, take 87 either north or south as its beautiful both ways. Awesome! That's pretty much all I can say about it. I've driven all over the country on some of the most scenic roads around and this one is in my top three. The Black Hills National Forest area ranks right up there with most of the riding of done in Colorado and Montana. If you've never been to this area you'll see why the Lakota called this region the black hills ... because of the starkness of scenery surrounding this area, the black hills really do look black as you approach. However, when in the midst of the Black Hills you will revel in the lush dark green of the Ponderosa Pines and Black Hills Spruce and the many beautiful tanish/grey rock outcroppings that are sprinkled all along the drive! For roads that get driven on quite often they are in pretty decent shape. There are some really nice twisties on this road if you like that sort of thing (especially just south of Keystone). Some of the people we road with were a little intimidated by them at first but we took it slow and no one put their bikes down and all were elated we took the drive. It was a little crowded the weekend we were there with traffic so I wish I would have planned to work in a weekday ride of this route - maybe next time! The Iron Mountain Road Website states that there are 314 curves, 14 switchbacks, 3 pigtails, 3 tunnels, 2 splits, and 4 "Presidents." There are so many places to stop at that you could spend a week here and the scenic drive could take days. Keystone, SD is a major tourist town with an 1880 railroad that takes you through the beautiful Black Hills scenery, a large cave called Rushmore Cave that you can tour and do things like zip-lining, a gold mine historic center, and a bunch of more classic touristy things like miniature golf, an alpine slide, and plenty of gift shops & restaurants and much more!!!! Photo contributed by visitor in Oct 09: "Dodging the buffalo on 16A!" on August 23, 2014 3 out of 3 members found this review useful. Rode this June '14 on the home from Yellowstone. Traffic was minimal so the ride was especially pleasant. The pigtails on Iron Mountain Road are a hoot especially if you've never seen one before. Finally some highway designers with a sense of humor. The views are inspiring at the lookouts. My GPS was really helpful on this road to see ahead around the turns and adjust my speed accordingly. There are a number of hairpins and some great sweeping turns. To be able to know ahead of time how sharp the turn was saved my bacon a few times. on September 1, 2016 1 out of 1 members found this review useful. Great road drove from south to north. The scenery is spectacular and the road is full of sweepers and twisties. Not for the faint of heart or new riders. The tunnels are single lane and were built to frame Mount Rushmore. The pigtail bridges are a lot of fun as well. on February 28, 2015 1 out of 1 members found this review useful. Ride south to north to get a view of Mt Rushmore through a narrow tunnel! I rode this route twice, both times from south to north, first time it was about an hour before sunset and cloudy - I was pretty much the only person on this road. Second time was the next day in the morning, it wasn't crowded but there were many cars and bikes the week before Sturgis Rally. on January 27, 2013 1 out of 2 members found this review useful. We do this route during the rally usully. Good pavement and a lot of places to stop. on January 2, 2018 0 out of 0 members found this review useful. I've ridden this area in 2015 and 2017, great road condition, scenic as hell hills and trees, bike friendly (lots of bike), unique roads (tunnels, pig tails, split roads), well worth it. on October 2, 2016 0 out of 0 members found this review useful. a friend of mine were in the area for sturgis. took all the rides in this area that you can. deedwood, custer city name it we were there. went to wyoming thru the big horn mts to cody. any direction you go cant be wrong. will do this again. roads are in great shape lots of places to stop for food and gas. if you are a RIDER and have not been here, do it while you can. did the beartooth and chief joseph words cant explain it. on March 28, 2016 0 out of 0 members found this review useful. on January 27, 2013 0 out of 0 members found this review useful. We ride this route every year when we go to the Sturgis Rally. We are going to go before the rally this year to avoid what has become Sturgis Cop week instead of Sturgis bike week. Did this ride to the north on the a.m of August 5, 2009 and to the south that p.m. Beautiful ride with buffalo in the road in both directions. Dodging the buffalo..is no laughing matter. I almost got broadsided by a big angry bull.. The rest of the ride was great. I have to agree this is some of the best riding I have ever done. If you ride this route early in the morning you will have plenty of animals to dodge. Good pavement and great scenery, but watch out for animals. There are not many passing areas so traffic can be a problem. While passing through Rapid City on our way to Montana we stayed in the area, at some friends recommendation. We rode this route one evening and found the ride was amazing! Especially along the East side of the park going north towards Mt Rushmore. In several places you ride through a tunnel out the other side over a bridge and the road makes a 360 back under the bridge. I recommend this ride highly!